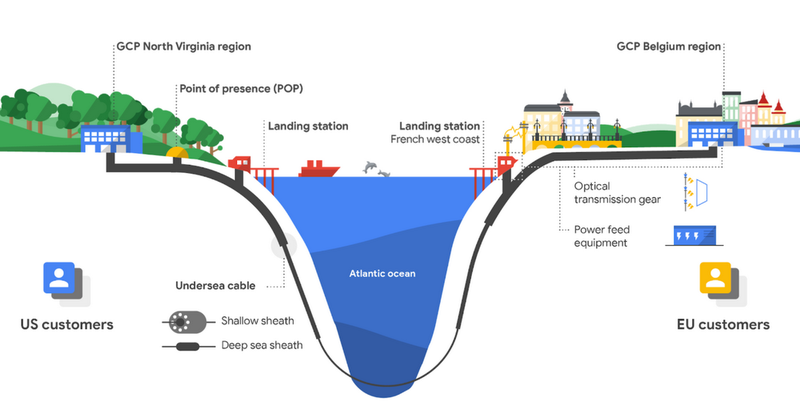 On Tuesday, Google announced yet another massive subsea cable project, this time a private line stretching across the Atlantic Ocean to connect a data centre in the US directly to another in Europe. As Google’s Jayne Stowell explained in a blog post, companies which handle massive amounts of data have three options when trying to cross the ocean: leasing capacity from an existing cable, partnering with other companies with similar needs in what is called a consortium deal to build one, or simply doing it themselves. Though such projects typically cost hundreds of millions of dollars — including both the cost of the cable and the specialised surface facilities that need to be built to connect them at either end — owning its own cable will allow Google to directly connect its data centres without having to share any of the bandwidth.